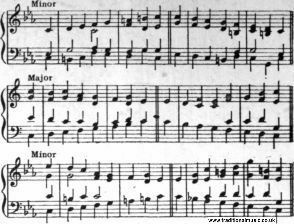 Our attempts at keyboard composition have hitherto been confined to four-measure phrases; these may now be extended to periods. The normal period consists of two phrases balanced in some way against one another. The simplest plan for securing symmetry is to make the two phrases identical, except for the cadences. The first phrase (called the antecedent) ends with a semi-cadence, usually the succession I-V; and the second (the consequent) ends with the perfect cadence. The main difficulty of our subject is for the student to remember accurately what he has already played. Few either have by nature, or gain by practice, the power of remembering all that has been played. In the majority of cases the most that can be looked for will be a general recollection of the subject-matter rather than the power of reproducing every detail. Yet the repetition or reproduction of what has been already stated is one of the chief factors that go to intelligent and artistic results. With a passage as short as the phrase there will be little difficulty in immediate reproduction, and constant practice in this will assist the student by cultivating the memory and thus securing coherence and consistency.